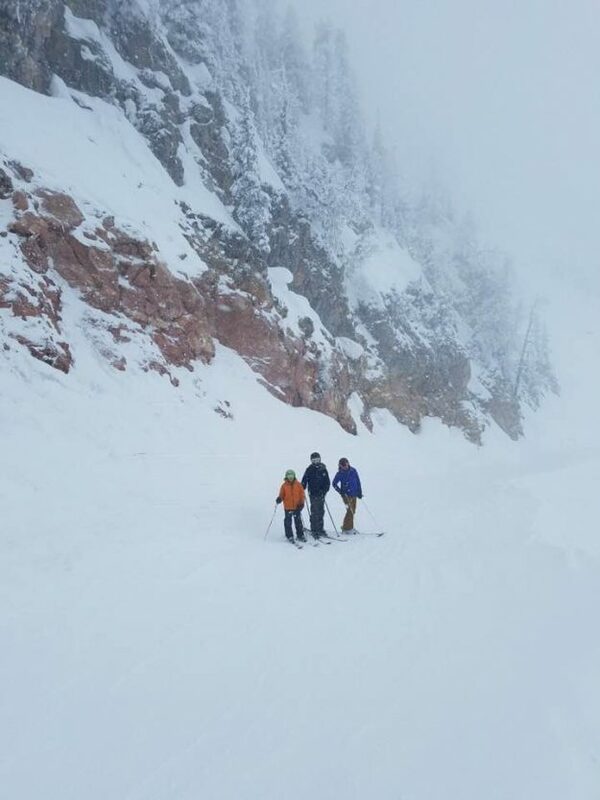 There are some big rocks at Bridger Bowl (David O. Williams photo). Based on my Facebook feed, a lot of Vail Valley residents are done with ski season, hitting beaches around the globe during last week’s Eagle County School spring break. Not the Williams family. We went full-on diehard during what’s been an above-average ski season – skiing from Utah to Montana and back on an epic Yellowstone-inspired ski road trip. Granted, we came back a week later to some major melting in EagleVail (apparently it got quite warm while we were gone), but everywhere we went on our way to Bozeman and back, we had a little bit of new snow under our skis. And ski season is far from done in the Vail Valley. Vail closes Easter Sunday, April 21, and Beaver Creek shuts down on Sunday, April 14. And there’s new snow in the forecast for this week and on into next week! Vail currently has a 75-inch settled base after receiving 313 inches of snowfall so far this season. Beaver Creek is right at 300 inches for the season, with a 70-inch settled base. That’s a big improvement over last season, when it took nearly three feet of snow in early April to get both resorts over the 200-inch mark for the season. Conditions were good in Utah, too, where we checked out Sundance on a surprise powder day on Sunday, March 24. The next day we skinny skied at the base of spectacular Mount Timpanogos. Then it was up through Yellowstone National Park, past Big Sky to Bozeman, Mont., where we stayed at the Element Bozeman – a LEAD-certified Westin property right on Main Street. If you haven’t been to Bozeman – home to Montana State University (and our oldest son Nick) – you have to check it out. 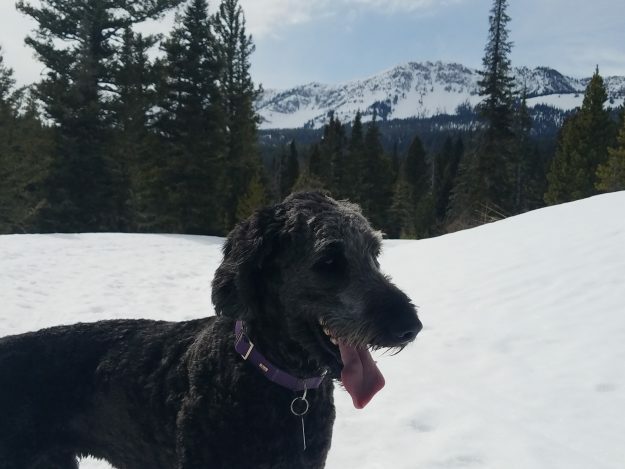 Lots of good restaurants and bars right on Main Street, and just a quick 15-minute drive up to Bridger Bowl, where we hit their nordic center and some nearby dog-friendly trails on Tuesday, March 26. Monty scopes out the nordic track with Bridger in background (DOW photo). Big Sky, where we skied on Wednesday, March 27, was spectacular if a bit muddy in the parking lots. A light dusting the night before created what our youngest son Rennick dubbed “butter on bricks” snow conditions, and the tram was closed due to skied-off, icy conditions on the steeps up high. The fault, one lifty told us, of too many Ikon passes being sold this season. No such problem at Bridger Bowl the next day, where four inches of new snow and very few people added up to some great conditions in the wide-open bowls and glades. Schlasman’s lift up to the Ridge (mandatory avy gear) was closed due to a lack of visibility during the storm, but it was still a highly worthy ski day. Then it was back on the road Friday, March 29, and a spin through Yellowstone National Park in the winter (so few people compared to summer … it was bliss), the cheesy snowmobile town of West Yellowstone and then all the way back to Park City, Utah, where we skied yet another surprise powder day at the Canyons on Saturday, March 30, before heading home to EagleVail. Some dining highlights if you try to duplicate this trip. First, we did lunch at Bin 707 Foodbar in downtown Grand Junction on the way out and have to highly recommend its fresh, organic cuisine (I know, in GJ, right?). Then the Sunday brunch at the Foundry Grill at Sundance is worth the trip even if you’re not skiing – and just a few miles up the canyon from Orem. In Bozeman, I’m going to recommend the food at both the Squire House (the restaurant and bar in the Element) and my namesake Dave’s Sushi. Be sure to check out the scene at the very large and very cool Montana Ale Works. Finally, if for some random reason you’re passing through West Yellowstone, I have to recommend the Slippery Otter Pub (sorry, no website). Now to knock the mud off all my ski gear and get ready for the next storm to roll through the Vail Valley. Cheers.